Unhappy with iOS 5.1 and tethered booting a jailbroken device? 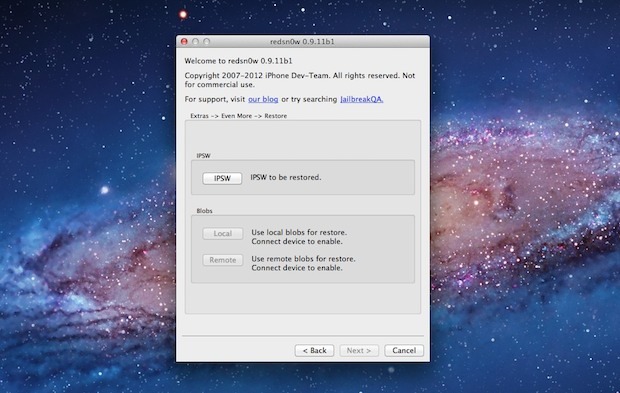 A new version of the redsn0w jailbreak utility allows users to downgrade their iOS hardware from iOS 5.1 to iOS 5.0.1, allowing for a return to an untethered jailbreak with the previous iOS version. Perhaps most significantly, the redsnow assisted downgrade works on all A5-equipped hardware, including the iPad 3, iPad 2, and iPhone 4S. There is a caveat though, downgrading is only possible for iOS devices which have SHSH blobs saved with Cydia or TinyUmbrella, an activity that must have been performed on a jailbroken device at the time it was running 5.0.1. To use the new downgrade functionality in redsn0w, download the latest version, launch the app, and click on “Extras” followed by “Even More” and then “Restore”. You will need the iOS 5.0.1 IPSW file to complete the task. For those without SHSH blobs saved, there remains a tethered jailbreak available for iOS 5.1.1 and an untethered variation for all devices is currently in the works with a release expected sometime over the next few weeks. You can find more information about this specific release on the Dev Team blog. I thought I could save blobs to tiny umbrella without being jail broken? i have SHSH save for it…. can i downgrade it ti 5.0.0????? HI i was in big trouble please help me. I was using 4.3.3 on iphone 4. I suddenly updated it to ios 5.1.1 then my ios baseband is changed to 04.11.08 Now my iphone doesnot show the network. it shows “No Service”. I also havent saved my SHSH blobs while i am updating. Can i downgrade it to ios 4.3.3 so that my baseband is 04.10.01. Please please any one can help me. yes u can first of all download an tiny umbrella to save all ur lost shs files. then build an custom ispw with i faith enjoy!